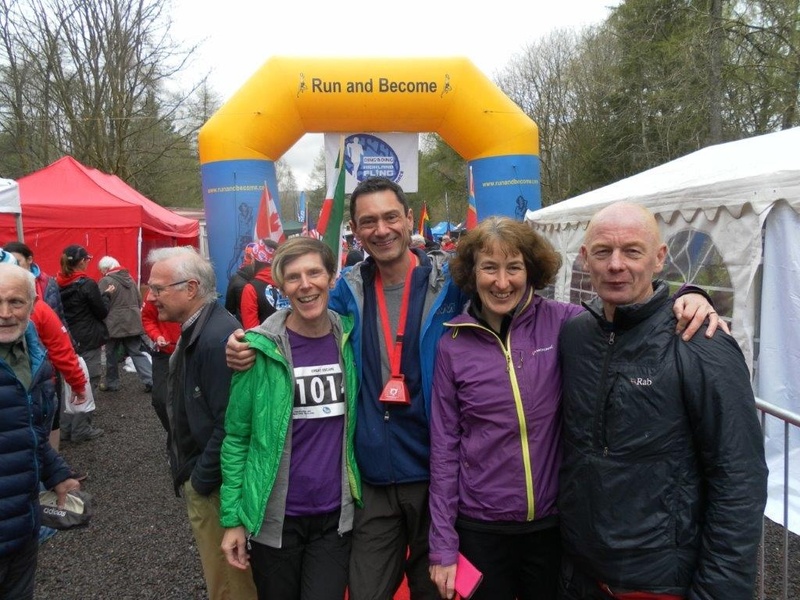 On 29 April 2017 four of us took part as a relay team in the Highland Fling, a 53-mile ultra-marathon in West Scotland. The route starts in Milngavie and follows the east coast of Loch Lomond on the first 53 mile section of the West Highland Way. 50 4-person relay teams participated alongside 700 solo runners who were doing the full 53 miles. We all carried some sort of injury and joked that we had three good legs between the four of us. We repeatedly told each other that we were there to have fun and where we finished was not the point, and I think we all truly believed this as we felt we had no choice but to simply go with the flow and stave off any disappointments that were bound to come later. Let’s just do the event and have fun running as a team in a glorious location (and a few beers at the end). With that in mind it was very early out of bed to get from the B&B to the 7.00am start but we were all excited and feeling ok and ready to get going. Relay teams are chosen by ballot so it was a mixed bag we saw milling around waiting for the off and whilst we waited we couldn’t help but size up the opposition. Some tough looking contestants, some much less so. The heavily suppressed itch of competitiveness started to reappear. Melanie took the first leg, which was fast & flat and described as “similar to bombing along the railway track in Keswick – only with more flippin’ stiles & gates!”. Melanie has a thing about gates. With injuries preventing any recent experience of a running this far, Melanie set off about 3/4 of the way down the pack with expectations to finish but in no great style. Bang and they were off and in a minute it was almost silent apart from the organisers dismantling the start enclosure in record time. The remaining three of us walked back to the car and had a surreal 30 minutes having a coffee and shopping in Tesco whilst Melanie ran on. We arrived at the 1st change-over point in plenty of time, or so we thought, but soon after there was Melanie racing across the final field a full 15 minutes ahead of schedule and well up on her starting position. That was it, it was game on! All thoughts of ‘just having fun’ had been replaced with ‘how well can we do?’. Clearly the views were not the main distraction to running though, as on finishing with a bloodied knee it transpired she had seen a sign asking to preserve frog habitat and had been so interested in looking into a pond for any frogs that she had tripped up. Sorry Helen, I had to reveal the truth. 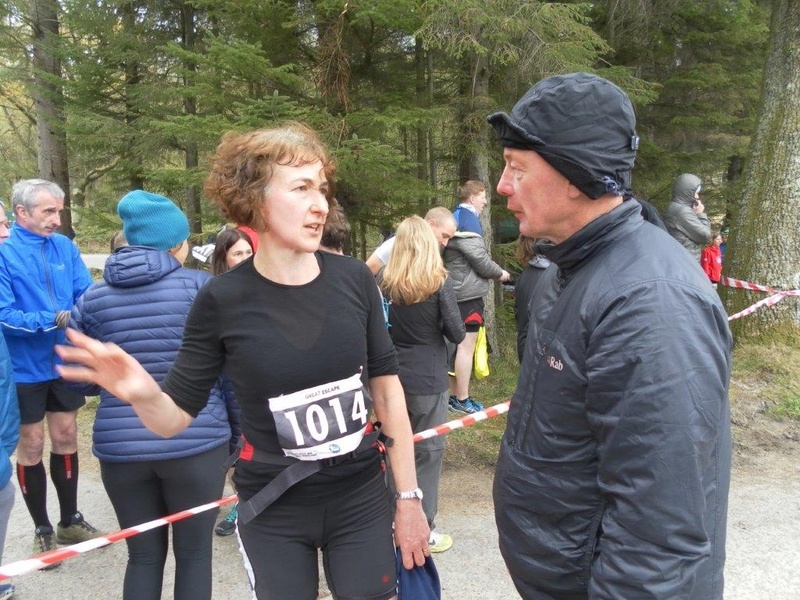 It was quite a long and nerve-wracking wait at the next stop but, once again, Helen came storming in ahead of schedule and having taken out some more relay teams it was my turn to get away. This is frequently described as the Technical Section. A gentle few miles of slight downhill and slight rises is a great warm-up and I easily trotted past a number of Relay runners that Helen had been closing in on. After a time you cross a wooden then concrete bridge by a house near the side of the Loch. This is where the easy running stops and things get more complex with tree roots and rocks to negotiate. Nothing too bad, a bit like running round the gnarlier sides of Ennerdale or Crummock waters. Feeling cocky I sped up. Then the real technical bit started, with the trail turning into constant up and down, clambering over wet rock (did I mention it started to rain just as the rocks appeared), huge tree roots, up steep banks and down short drops. If you are used to the fells it isn’t so bad but I had picked up another relay runner on my heels and he was sticking to me like glue. I couldn’t afford to slow down so it was push, push, push at maximum speed, not helped by a left foot that had perversely chosen now to go completely numb. After about 5 miles of this I was tiring fast and when we finally emerged into meadow and grassy trail I didn’t have the energy to speed up again and my shadow passed me easily. The last 3 miles was spent trying but failing to catch him. Jon told me I had probably gone anaerobic, which sounded like as good an excuse as any. I was happy with my finishing time as I don’t think I could have done it any faster, but boy was it tough. A fantastic trademark bouncy and excited cheering from Melanie welcomed me in and it was over to Jon. Jon’s leg is a bit of a rollercoaster but he managed to take out a few tiring relay runners. Jon had been waiting in his kit for over 6 hours by this point so was both nervous and raring to go. Despite ‘setting off too quickly’ and so losing some steam for the last mile or so he cracked out a great pace. So good in fact that he arrived at the finish whilst we were still in the local tea shop! Jon gallantly waited for a few minutes near the finish line finishing but on seeing another runner approaching couldn’t wait any longer and crossed over. It is terrible thing to get to the end and there is no-one there to greet you and we all felt very guilty (but full of tea and scones). The event itself was fantastically organised, great atmosphere, lots of tasty grub at the end, a real red-carpet carnival event at the finish with each runner getting a loud PA announcement and huge cheers from the waiting crowd. 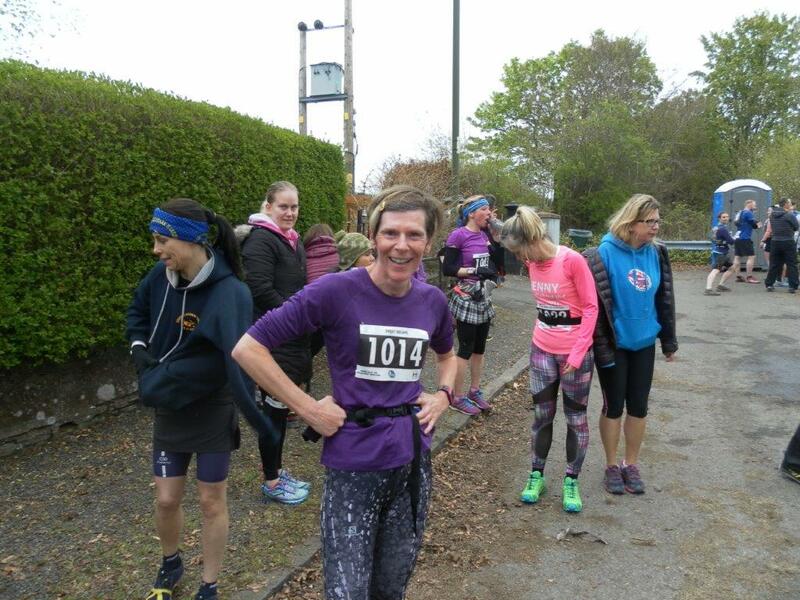 My overriding memory of the running was passing ultra-runner after ultra-runner – it felt like well over 100 – and without fail every one stood to one side and every one said ‘well done’ or ‘good luck’. That is from people who have already run the equivalent a trail marathon and are busy doing the next. They deserve some serious respect. I can thoroughly recommend a relay race and this particular event to everyone. It is such good fun to combine the usual personal challenge of a race with relying on your team-mates and knowing they rely on you and achieving a group result. We had a great time and the most thanks must go to Jon who entered us and organised the whole team flawlessly. We will be entering that ballot again next year.